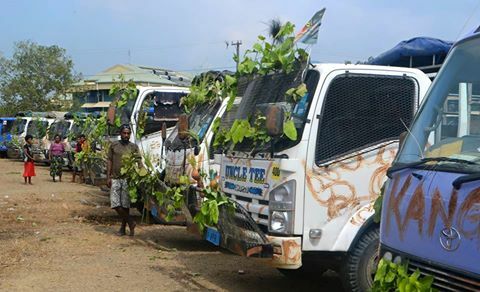 More than three hundred (300) vehicles and a three thousand strong crowd of support, is expected tomorrow on all roads leading to Waigani in a bid to show their support for the Government and the good work it has done both in the development of the city and in the rural areas of Gulf and Kairuku. “The convey is made up of vehicle owners from Gulf, Kairuku and NCD and we will all meet at 7am at Laloki close to the mental Hospital before we go into the city at 9am and visit key parts of the city before heading to Waigani to see the outcome of the Vote of No Confidence,”said the organiser Ned Gong. “The purpose of the large convey of vehicles is to show the people of the nation that the grassroots and rural people of this country have seen real development and that a change of the prime minister is not the right thing at this time, it’s a show of demonstration of support by the rural and grassroots people of the nation that we have seen change.” added Mr Gong. Meanwhile, Metropolitan Superintendent Ben Turi has stated that no such notification of a convey of vehicles has reached his office and he is calling on all residents to ensure that normal daily activities are carried out tomorrow. “We will not allow any grouping of vehicles to convey around the city. We will carry out our normal police duties and no authorisation has been given for grouping of vehicles to take place tomorrow, if they are coming from Laloki we will stop them at the bridge”, said Turi.